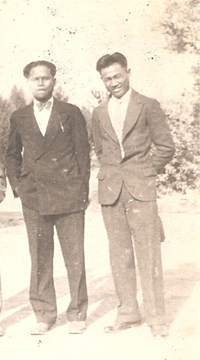 Felix Ayson (on right), in LA circa 1920. That’s how I imagined it. Here’s what I know for sure. First, my Uncle Felix E. Ayson was my Mother’s uncle, my Mother’s maiden name being Cristeta A. Ramirez, “A” for Ayson. For all the time I knew him, from when I was three until he died 27 years later, Uncle Felix was very hard of hearing, wearing big hearing aids in both ears. His smile, his misting eyes, his habit of lacing his speech with downward-sloping “now’s”—I remember all those, too, distinctly, as distinctly as I remember the phone call he made to our house in Hayward, California, in late April 1964. Because of his deafness, I could hear him clearly as he shouted through the phone when my Mother answered. He wasn’t crazy. He carried the newspaper obituary in his wallet the rest of his life. At the funeral he kept murmuring “No, No, No,” mixing it with his “now’s,” and I will always remember how he said, “I want to say more sweet words,” rubbing the fingers of his right hand gently together in the direction of Aunt Etta’s casket as if those words might conjure something up. When that casket was being lowered, he did jump into the ground with it. I was 15, not quite part of the adults, who exploded into action, rushing forward, legs pumping, arms thrusting in to pull him out, shouting, “What are you doing! Are you crazy! My God, My God!” I saw them fanning him as he slumped in a dead faint on a graveside chair. Then I didn’t see Felix Ayson for nearly five years, and no one I knew seemed to know where he went. 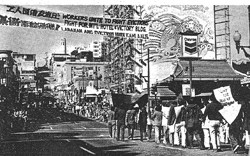 One of many marches protesting evictions at the International Hotel, San Francisco, late 1970′s. In October 1968 the tenants of San Francisco’s International Hotel received their first eviction order, an order that kicked off a 10-year struggle to save the hotel before it was completely demolished in January 1979. During that time there were at least five eviction orders, each one fought over with stays and counter-orders to lift the stays. Suits and petitions and appeals and injunctions at every possible legal turn ran up and down every judicial level—Board of Permit Appeals, State Court of Appeal, even the State Supreme Court—and significantly occupied three San Francisco Mayors: Alioto, Moscone, and Feinstein. The owner of the hotel, Milton Meyer and Company, backed initially by the city, proposed an ambitious high-rise/parking complex, but the eviction was unpopular from the beginning. By December 1968 opposition from Assemblyman John Burton and the San Francisco Human Rights Commission had already halted the initial action. On March 20, 1969, even the Ford Foundation got involved, guaranteeing the owner up to $25,000 a year in rents (about twice what it had been collecting), a move that must have emboldened the elderly Filipino tenants who, later that week, told the Department of Public Works that they wouldn’t leave the hotel even if ordered. “If the hotel is demolished,” they said, “it will be over our bodies.” By early 1970 students from the State University of San Francisco and the University of California, Berkeley, and seemingly every radical group in the Bay Area were deeply involved in the cause to help a group of mostly elderly Asian and South Asian people keep their home. “Save the International Hotel: I Am Old, I Am Poor, I Am Tired, I Don’t Want to Move.” So read printed broadsides made and distributed by the Berkeley students. It had become a modern-day David-and-Goliath saga. The other side literally did have a kind of Goliath. Imposing six-foot-four-inch Judge Ira A. Brown consistently sided with Four Seas Investment Corporation when it bought the International Hotel in October 1974. In April 1976 he even directed a deadlocked jury to render a verdict in favor of Four Seas—and why not? Four Seas, and before them Milton Meyer, had full legal rights to do what they wanted. But something larger, almost mythical, was being contested. Even Richard Hongisto and James Denman, the sheriff and undersheriff charged with executing the eviction orders, refused to cooperate. “Laws in our society,” Hongisto said, “are written to protect people with property and money,” and “I get a real sense of being on the wrong side of the fence…I see elements of class struggle here.” On December 20, 1976, both were charged with contempt of court for refusing to carry out the eviction. Though they later made attempts to serve eviction notices, on January 10, 1977, they were both sentenced to five days in jail and fined $500 each for again failing to evict. How conservative is the U.S.? Presumably liberals and progressives led the way to electing Barack Obama, but maybe it was really the essentially conservative middle frightened off by ultra-conservatism just enough that it suppressed, for a moment, its raging fear of socialism—that “S” word (not to mention the “C” word), which, as I write the first draft of this essay in summer 2009, is being used to shout down rational debate about the President’s attempts to reform healthcare. Our fear of socialism seems cartoonish to most of the rest of the world, but that’s been us practically forever. Even amid the radical atmosphere of the Bay Area in the 1970’s, the fear of socialism raged. Bad enough that elderly residents had led in forming the International Hotel Tenants Association (IHTA). Soon the KDP—the Katipunan ng mga Demokratikong Pilipino (Union of Democratic Filipinos)—long the voice of the Filipino left was taking a leading role, too. Socialists! Commies! On July 29, 1976, Mayor George Moscone—two years and four months before Dan White would assassinate him and his old nemesis Harvey Milk—presented a plan for non-profit ownership of the International Hotel. The city would use eminent domain to acquire the hotel, use Housing Authority funds to compensate the owners at fair market value, then turn the hotel over to be operated by a non-profit run by its elderly tenants, which would then pay back the Housing Authority. It was novel—it smelled of socialism—to use eminent domain to acquire private property to then convert into public housing. But supposing the plan would go through in the first place, why then should the present I-Hotel tenants get to cut ahead of the many, many other poor already in line for low income housing? Those groups and those representing them weren’t quiet about that injustice. As is often the case, the “oppressed” weren’t exactly united. In his article “Reactivating the Spirit,” Glen Jermyn Andag puts “the steps leading to the downfall of the International Hotel” in the same league with other key American struggles like the Civil Rights Movement, the Delano Grape Strikes led by Caesar Chavez, the steps leading to Nixon’s resignation, and the Vietnam War protests. Still, in retrospect, partially because of its historic positioning in the midst of Ronald Regan’s governorship of California and on the verge of America’s Reagan Era, defeat seemed inevitable, and on August 6, 1977, the International Hotel was boarded up two days after San Francisco police stormed the building and cleared out its last 40 remaining elderly tenants and 100 of their most militant supporters. On August 7, 1977, this article appeared on the first and last page (1 and 20) of section one of the San Francisco Chronicle. On the front page, a picture of a policeman swinging an axe into a door; on the back, a nearly 1/3-page picture of an elderly Filipino tenant, flanked by two young supporters, being escorted out. He looks calm. The caption describes his supporters as weeping. The byline lists George Snyder and Birney Jarvis. “The International Hotel was finally boarded up yesterday after riot-garbed police and sheriff’s deputies cleared the red brick building in the 800 block of Kearny street of about 40 elderly tenants, including their long-time spokesman Felix Ayson, and possibly 100 of their militant supporters. “A crowd of sympathizers on Kearny street estimated at between 2000 and 3000 persons attempted to block the eviction operation but finally pulled back as deputies stormed into the building. “One person was arrested during the early morning confrontation and five were treated at Harbor Emergency Hospital for minor injuries and released. “Sheriff Richard Hongisto, who earlier spent five days in jail for failure to enforce an eviction order, claimed he was the first officer inside the embattled hotel yesterday. “‘It was the most distasteful job I’ve had since I’ve been in office,’ he said. “The sheriff, wielding a sledge hammer, knocked down some of the doors to tenants’ rooms and said he found elderly Asians crying. “‘They didn’t want to leave. They were being uprooted. They didn’t want to leave,’ he said. Mayor George Moscone, later in the day at City Hall, reminded newsmen that his administration had supported the protracted legal efforts of the tenants to halt the eviction. “The eviction had been planned for 12:30 a.m., an hour when traffic would be at a minimum and just after the midnight change in police shifts, meaning a maximum number of officers would be available for duty. “But word of the eviction hour had leaked to the hotel tenants and, by 11 p.m. Wednesday, a crowd of sympathizers estimated at 2000 persons had gathered in front of the hotel. “They chanted slogans, listened to a truck-mounted rock band, sang songs and listed to amplified updates on suspected police movements. “Shortly before 3 a.m., police blocked off Kearny street between Washington and Jackson streets. The action was about to begin. “Police riot squads, wearing jump suits and helmets with face masks, moved into position for the assault with their black riot sticks held at the ready like bayoneted rifles. “Nearby, a squad of 11 horse patrolmen unlimbered their nightsticks and soothed their prancing mounts while demonstrators standing 12 deep in front of the hotel locked arms and braced for the assault. 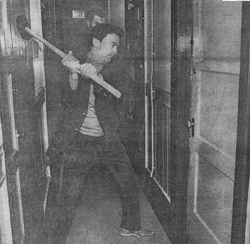 The policeman swinging the axe is not Richard Hongisto, but there is one picture of this steady opponent of eviction finally giving in to his official duty and breaking down a tenant’s door. His face seems to bear the marks of chagrin, and he swings a sledge hammer perfunctorily, with none of the energy the deputy on page one displays. Nevertheless, the picture will haunt him the rest of his life, both personally and politically. The decade-long battle to save the building at 848 Kearny Street was over. 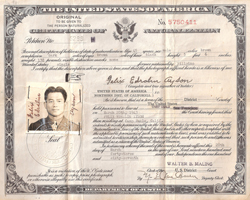 Felix Ayson’s naturalization certificate. He is pictured in his U.S. Army uniform. ♦ Read PART 2 of this essay. ♦ A draft of another part of this book project is “The Accidental Radical,” also on this site. This entry was posted in Family, Social Change and tagged Felix Ayson, International Hotel, International Hotel protest, Mayor George Moscone, San Francisco Chronicle, Sheriff Richard Hongisto. Bookmark the permalink. Hello Richard .. I would love to share this history with other Synigal family members with your permission on FB. Knowing our lineage is vital to our self worth. Thank you for this work. Hope all is well in your neck of the woods, we are all doing well.